New study quantifies the public health costs of polluted air from existing coal-fired power plants in the Western Balkans at up to €8.5 billion per year. New estimates of the huge health costs associated with air pollution from coal power plants in the Western Balkan region were published in March by the Health and Environment Alliance (HEAL). The report provides an estimate of the total health damage from air pollution released from coal power plants in five countries: Serbia, Bosnia and Herzegovina, Macedonia, Montenegro and Kosovo. Currently home to 15 existing coal plants with an installed capacity of 8.1 gigawatt (GW), the region could see the installation of 24 new projects with 7.8 GW capacity. The estimated health costs of future coal plants are also shown in the report. 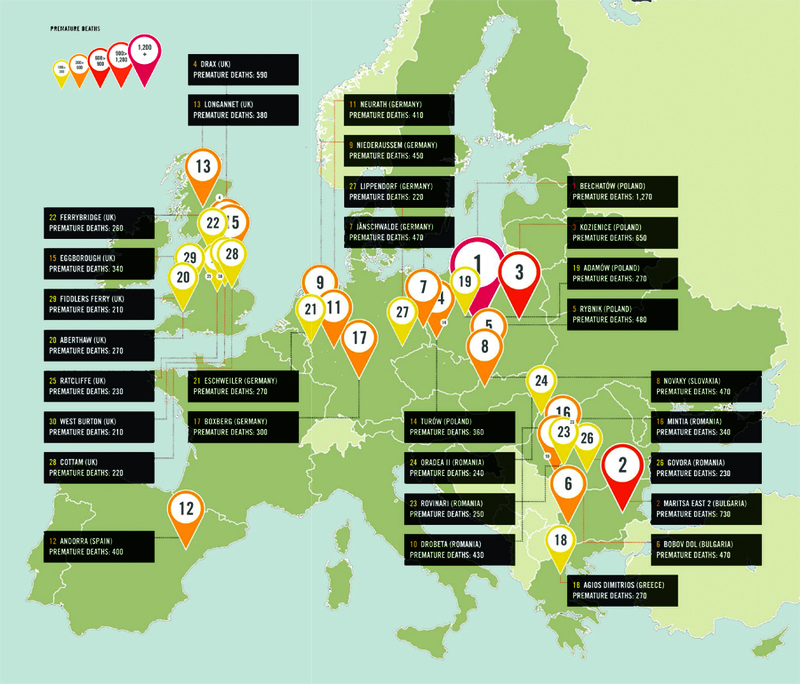 For its energy production, the region is heavily dependent on coal and lignite (the most polluting form of coal), and seven of the ten most polluting coal-fired power stations in Europe are located here (see table). 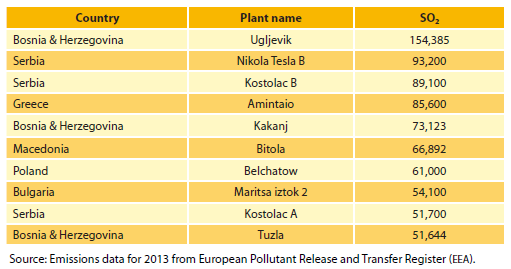 Table : The ten European coal power plants with the biggest emissions of sulphur dioxide (tonnes). The study puts the costs to health of emissions from existing coal plants in the five Western Balkan countries at up to €8.5 billion per year. This estimate covers costs directly related to air pollution from coal-fired electricity plants, including from premature deaths, respiratory and cardiovascular hospital admissions, new cases of chronic bronchitis and lower respiratory problems, medication use and days of restricted activity due to ill-health, including lost working days. A large proportion – more than half – of the health costs caused by air pollution from coal-fired power plants in the five Western Balkan countries is borne by the population in surrounding countries due to the transboundary effects of air pollutants being carried by the wind. According to HEAL, this shows that the EU’s current efforts to improve air quality in its member countries should not stop at its borders. EU policy-makers should also put their weight behind demands for strong air quality and pollution control measures in its Western Balkan neighbours. 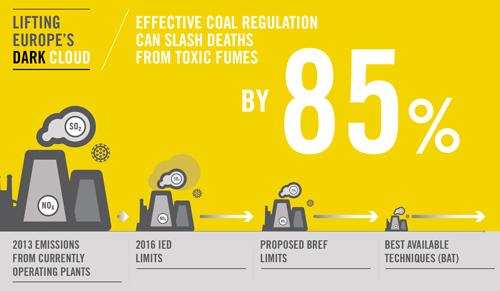 “Our new report quantifies the huge health costs associated with coal power generation in the Western Balkans, and uncovers the myth that coal is the cheapest form of energy,” says Anne Stauffer, Deputy Director of HEAL. She continues: “Opting out of coal offers the prospect of a healthier and more prosperous future. The EU should encourage the change to a healthy energy future by significantly increasing financial support for renewables and energy savings – for example, under the pre-accession programme. It would improve air quality and help tackle climate change in both the Western Balkans and in the rest of Europe.”. Source: HEAL press release 15 March 2016. A new study shows that the public heath costs of polluted air from existing coal-fired power plants in Turkey are up to €3.6 billion per year. A cost that will increase significantly over the next four years, if existing plans to double coal power capacity with another 80 plants are implemented. Coal power generation makes a considerable contribution to the country’s already huge air pollution problem. More than 97% of the urban population in Turkey is exposed to unhealthy levels of particulate matter, which is the most harmful pollutant for health. Source: HEAL press release, 20 May 2015. The entire report “The unpaid health bill, How coal power plants in Turkey make us sick” is available at www.env-health.org/unpaidhealthbill.